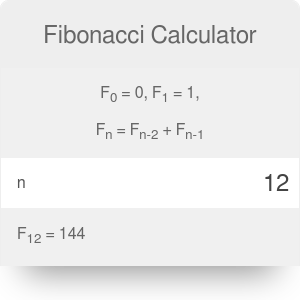 This Fibonacci calculator is a tool for calculating the arbitrary terms of the Fibonacci sequence. Never again will you have to add the terms manually - our calculator finds the first 200 terms for you! You can also set your own starting values of the sequence and let this calculator do all work for you. Make sure to check out the geometric sequence calculator, too! The Fibonacci sequence typically has first two terms equal to x₀ = 0 and x₁ = 1. Alternatively, you can choose x₁ = 1 and x₂ = 1 as the sequence starters. Unlike in an arithmetic sequence, you need to know at least two consecutive terms to figure out the rest of the sequence. The Fibonacci sequence rule is also valid for negative terms - for example, you can find x₋₁ to be equal to 1.
ψ = 1 - φ = (1 - √5)/2. Our Fibonacci calculator uses this formula to find arbitrary terms in a blink of an eye! You can also use the Fibonacci sequence calculator to find an arbitrary term of a sequence with different starters. Simply open the advanced mode and set two numbers for the first and second term of the sequence. x₁ is the second term of the sequence. The spiral in the image above uses the first ten terms of the sequence - 0 (invisible), 1, 1, 2, 3, 5, 8, 13, 21, 34. Fibonacci Calculator can be embedded on your website to enrich the content you wrote and make it easier for your visitors to understand your message.